Sometimes, when you visit a new online casino, you do so without really knowing what to expect in terms of style and tone. That is not the case with Park Lane Casino, the second you hear the name of this site, you know what you’re getting, a site that is aimed at the high-rollers, or at least those who harbour dreams of reaching such heights. Even if your only experience on Park Lane is on a Monopoly board, you know that you’re dealing with a site that is based on the lavish here. This is far from the only casino that utilises this theme, of course, and that makes it a challenge for this one to stand out. This quest to be seen as a contender is not aided by the name behind Park Lane Casino, Game Tech Group, who have a history of unethical practices including the use of bootleg NetEnt games, which have seen them blacklisted by many sites. There is no sign that such practices still occur at Game Tech sites, but the history matters to many players, who will understandably not touch sites on this network. However, if you do decide that you are willing to give Park Lane Casino a go despite Game Tech’s history, will the site make it worth it for you? If you are an experienced member of the online casino community, then you are likely to be fully aware that this section of this review is going to involve the words black and gold. Black and gold is the go-to colour scheme for every site that is going for sleek sophistication with touches of the affluent, and Park Lane goes the painting-by-numbers route when bringing those themes to life, or attempting to. The site doesn’t look unattractive, it would probably look quite smart if it was the only site you’d ever seen that took on this colour scheme and associated design touches, but it isn’t like to be close to the first you’ve seen that does that, and that just makes it feel boring. The layout is good enough, with navigation easy to follow, but it is basically the layout that you’ll find at every Game Tech site, down to the order of the games in the thumbnails on the homepage, combined with the colour scheme of every site that has chosen the same concept, which means that Park Lane Casino feels derivative, uninspired, and in no way exciting. “Play the Best Casino Games Online” crows Park Lane Casino, and, to be fair, this is a boast they are arguably capable of backing up. The list of software developers providing the games here has some glaring omissions (IGT, Microgaming, NetEnt, Playtech, Yggdrasil, etc.) but still manages to be impressive, with titles coming from the likes of BetSoft, BG, Booongo, Extreme Live Gaming, Felix Gaming, Fugaso, GameART, GameScale, GGL, MrSlotty, Playson, SA Gaming, and Spinomenal. Of course, if you are experienced with Game Tech sites, you will be aware that there is nothing particularly fresh about this collection, it’s basically the same one you get everywhere else, but that doesn’t take away from the fact that it’s a solid selection of games. Classic slots, video slots, table and card games, live dealer games, video poker, micro bet games, scratchcards, action games, there’s a lot to choose from here, and a good amount of options in each category. 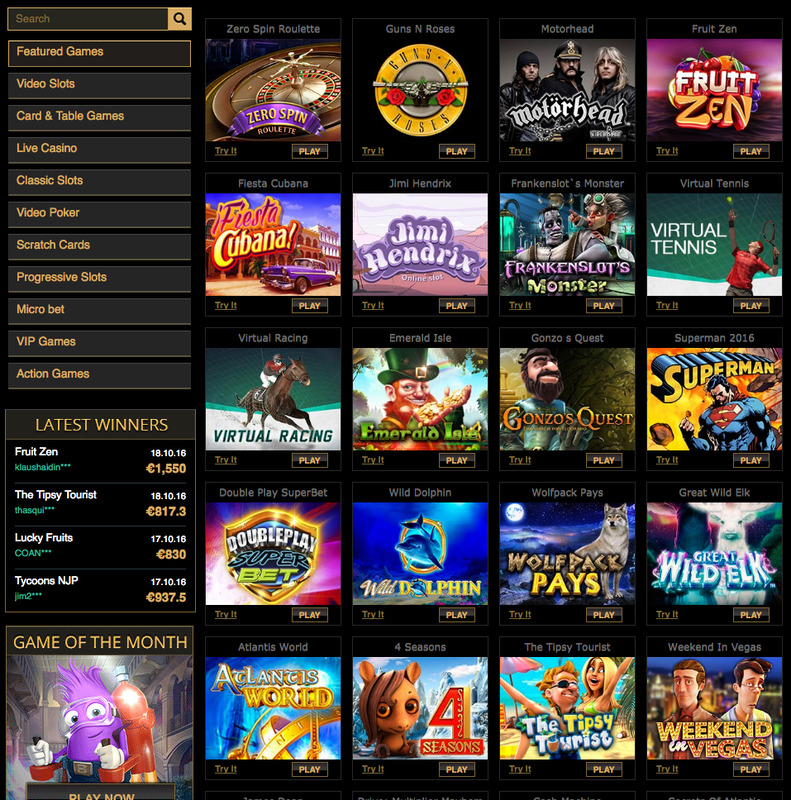 Is this array of games and game categories enough to guarantee Park Lane Casino success? Given the name behind it, and the dull design concept, probably not, but it might help.